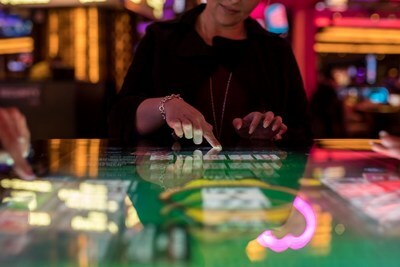 Caesars Entertainment and partner Gamblit Gaming bring first-to-market skill based games that combine the fun of competitive video game play with the excitement found in a casino environment. LAS VEGAS, March 30, 2017 /PRNewswire/ -- Caesars Entertainment Corporation (NASDAQ:CZR), the world's most diversified gaming and entertainment company, and Gamblit Gaming, the leading publisher for real-money and skill-based gaming for land based casinos, today announced that the first skill-based gaming experience in the Las Vegas market has officially debuted at Planet Hollywood Resort and Casino for its initial field trial phase. 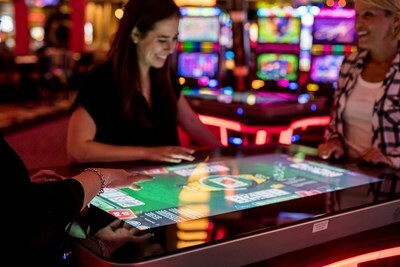 "Our partnership with Gamblit brings a unique experience to our casino floors and is an important step toward modernizing our customers gaming experience," said Caesars Entertainment President and CEO, Mark Frissora. "We're making tremendous progress in our efforts to reach a new generation of gamers who seek integrated skill-based gaming and Caesars is proud to be the first in Las Vegas to provide this innovative experience to our customers." Gamblit's highly social and interactive game tables, called the ModelG™ can host between two and four players for a head-to-head gaming experience. Each gaming terminal offers a unique, multi-player – multi-game machine with access to a shared 42'' touch screen, plus a USB charging port, purse hook and two cup holders for each player. The three game tables located at Planet Hollywood will initially feature two games at launch, Gamblit Poker™ and Cannonbeard's Treasure™. Gamblit Poker tests skill and speed, while allowing players to win up to 240x their bet in a single hand. Each player starts with two cards, followed by a single deck of cards shown in rapid succession in the middle of the table. Players have to quickly virtually grab the cards they need in order to complete the best possible poker hand. Cannonbeard's Treasure engages players in a fast paced game of cards, skill and naval warfare. Similar to blackjack but on a whole new level, Cannonbeard's Treasure challenges players to fill their hand without winning or busting, initiating a burndown. During the burndown, a set of additional cards will be dealt. The player who gets closest to the objective, without going over, wins a chest of gold. Pending final regulatory approval, additional Gamblit games will be installed at various Caesars Entertainment properties throughout much of Nevada including Caesars Palace, The LINQ Hotel & Casino and Harrah's Lake Tahoe. 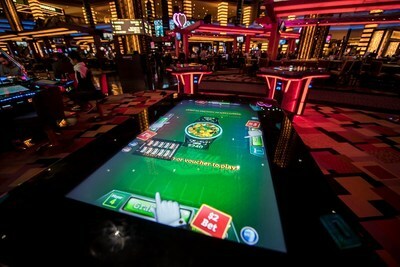 Harrah's Resort Southern California will be the first to debut the skill-based gaming tables in the state California. Once the field trials at these properties are complete, Caesars anticipates installing an additional 200 terminals throughout its U.S. based properties. Gamblit's new gaming technology will be launched under the Nevada Gaming Control Board's technology friendly "New Innovation Beta," program which accelerates the introduction of innovative gaming concepts to the market. The Nevada Gaming Control Board requires a field trial any time a new game enters the market, a period that extends for a minimum of 30-days. During this time, the game is installed and is fully operational, just like any other game on the casino floor. This partnership is the latest development in the company's ongoing commitment to create innovative gaming and entertainment experiences for guests. In the past year alone, Caesars has played host to Amazon's first-ever eSports tournament for mobile games, launched Las Vegas' first virtual reality lounge, featuring Oculus Rift®, at Alto Bar in Caesars Palace, and Bally's in Atlantic City New Jersey is currently hosting the inaugural Gears Pro Circuit™ Atlantic City Open - an open eSports circuit for "Gears of War 4," the latest interactive video game developed by the Coalition and published by Microsoft® Studios for Microsoft® Windows® and Xbox One®. Having already executed on exciting partnerships with innovative gaming companies like GameCo™ and Gamblit and other emerging companies in the space – who have married skill-based gaming in an interactive video game setting - Caesars Entertainment continues to demonstrate its leadership role in this space.